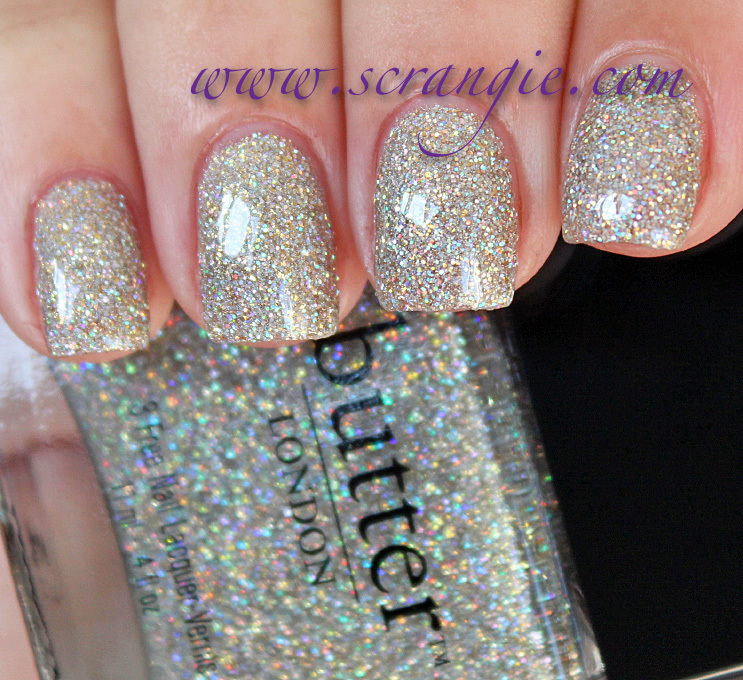 I'm not sure if this Butter London holiday collection has a name, but I do know that it's really freakin' glittery. And I like glitter. 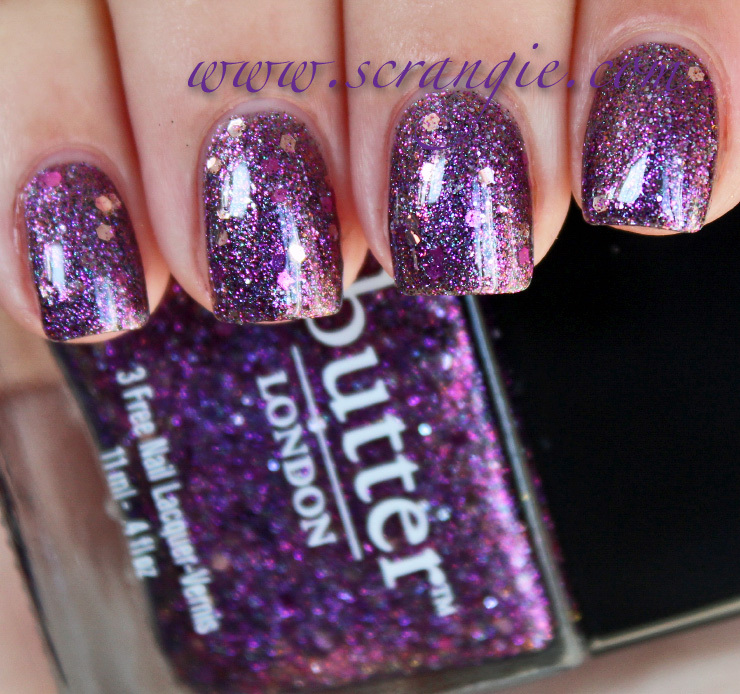 Butter London Fairy Cake. 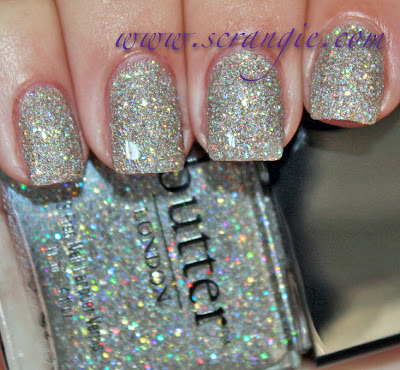 A mixture of very fine light silver glitter and larger (but still small) silver-based hologram glitter in a clear base. Not a unique color. Also seems to have a faded look to it compared to most other similar silver/holo topcoat style glitters. 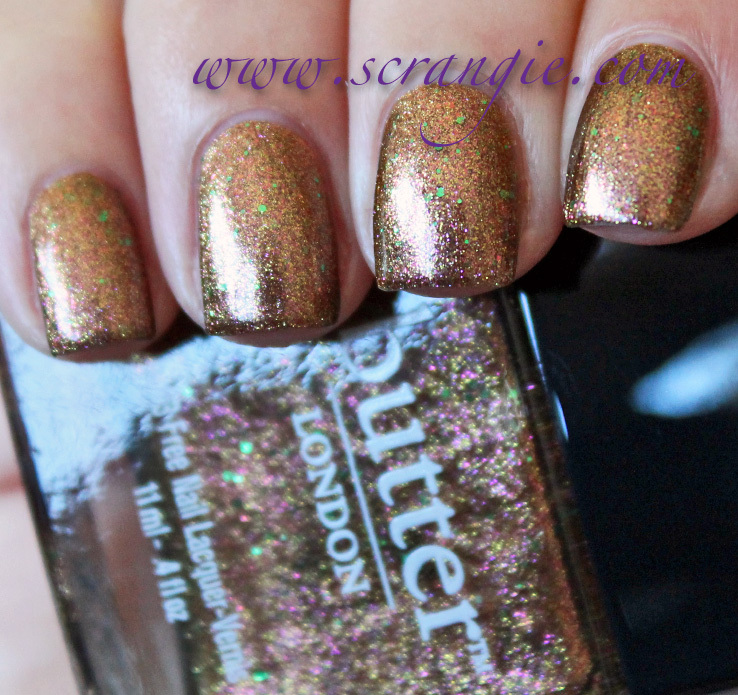 Butter London Fiddlesticks. A rich, deep magenta jelly base with tiny pink glitter. A little flash of purple here and there. 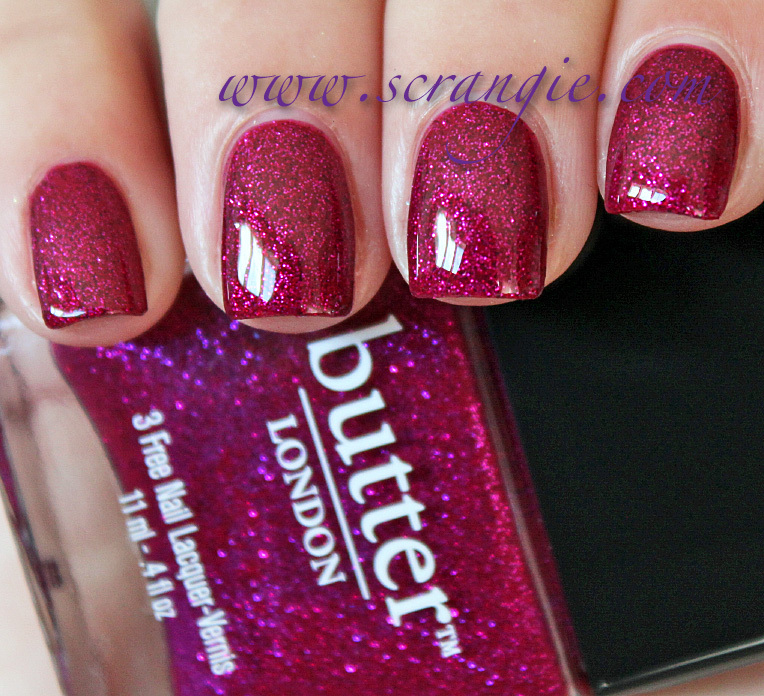 Makes me think of a pink/magenta version of something like China Glaze Ruby Pumps (or Butter London Chancer). 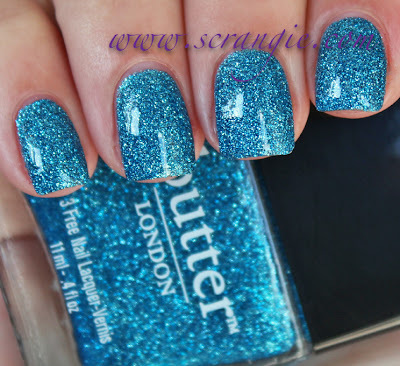 Butter London Jack The Lad. Dark evergreen base with yellow-gold, aqua-blue, and grassy green foil shimmer. Also has a slight blue flash when tilted at an angle. Extremely pretty polish. Somewhat similar to the new Zoya holiday color Logan but not an exact replica. Butter London Scallywag. 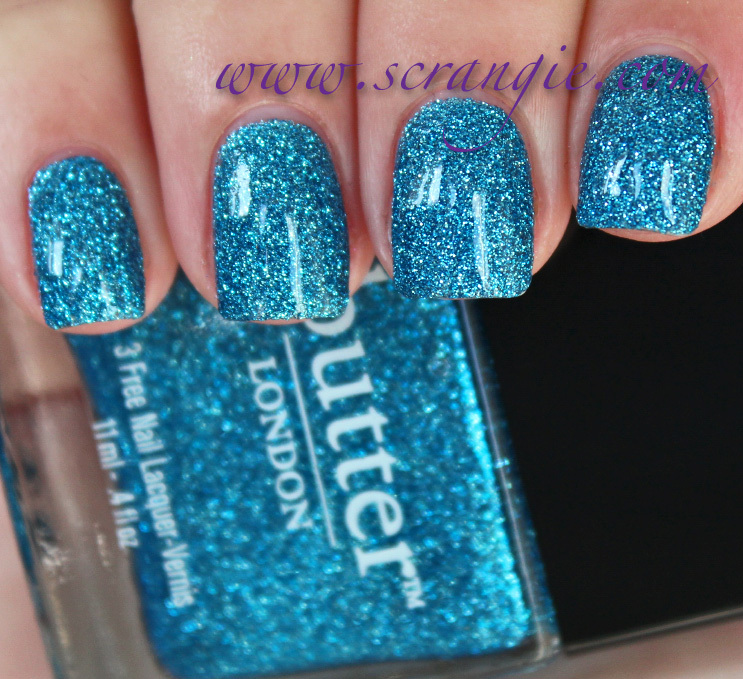 Tiny sky blue glitter in a clear base. Surprisingly colorful! And it's very sparkly, as any good glitter should be. It's also worth noting that this color dries to an attractive sugary/sandy matte finish (like the China Glaze fall glitters) if you don't use topcoat. 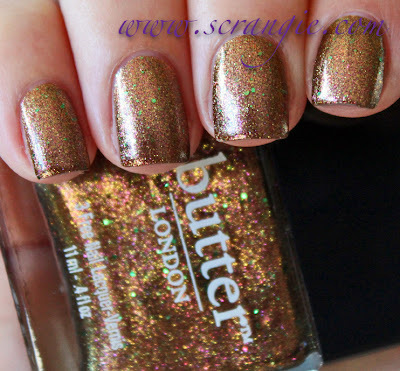 Butter London Scallywag, no topcoat. Butter London Scuppered. This looks more like Thanksgiving than Christmas to me! It's a multicolored metallic sparkle polish made up of different shades of brown, bronze, gold, red, and orange, plus it has some larger pieces of bright green glitter for even more color. It's a lot like Jessica Gingersnap, just browner, a little darker, and with added green glitter. Butter London Shambolic. Shambolic has a lot going on. It has very dark eggplant purple microglitter, lighter true purple microglitter, all kinds of speckles pink, lavender, blue and red glitter, and on top of all that it has large pink and silver hexagon glitter. To make it even more complicated, it even has a warm, sort of golden purple duochrome shift when you hold it at an angle. It's a whole galaxy of purple. The formula on these was good. The texture of each one was different (something I've noticed among all the Butter London polishes I've used), but the application on all was easy and presented no difficulty at all. I used three coats of each polish and none needed more than a third for complete opacity. Dry time is average bordering on long. All of them look best with two coats of topcoat. Doesn't feel like much of a winter/Christmas/holiday collection to me, but I'm still into it. Look at all those different kinds of glitter! Fairy Cake and Scallywag are the least unique in the collection and I'd probably skip those in favor of cheaper dupes (like the ones from Color Club), but the rest are pretty fantastic. What do you think? Like 'em? 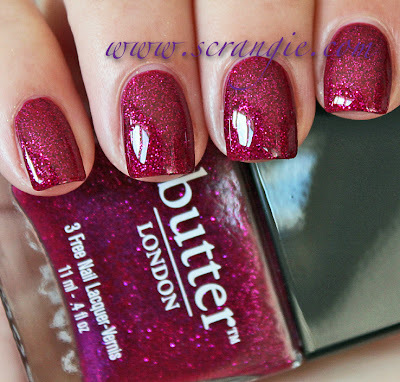 The Butter London Holiday 2012 collection is available now at Macy's (which is where I ordered mine). Fiddlesticks, Scallywag and Jack the Lad are the ones I must have!! These are gorgeous polishes! So, so pretty, Sgrangie your nails are beautiful! My favourites are Scallywag and Shambolic! scallywag makes me think of a sparkling swimmingpool! I love Scallywag and Scuppered! Your swatches of Fairy Cake are sooo pretty but I'm wondering if it's not that special of a polish because looks like something I'd already have...of course nothing that dense though! Scallyways and Fairy Cake are actually my favorites. I don't have anything like them but my collection isn't all that big. Bloomin typical the one I really want is not available in the UK laughable when you think it is Butter LONDON!! Oh, these are gorgeous!! 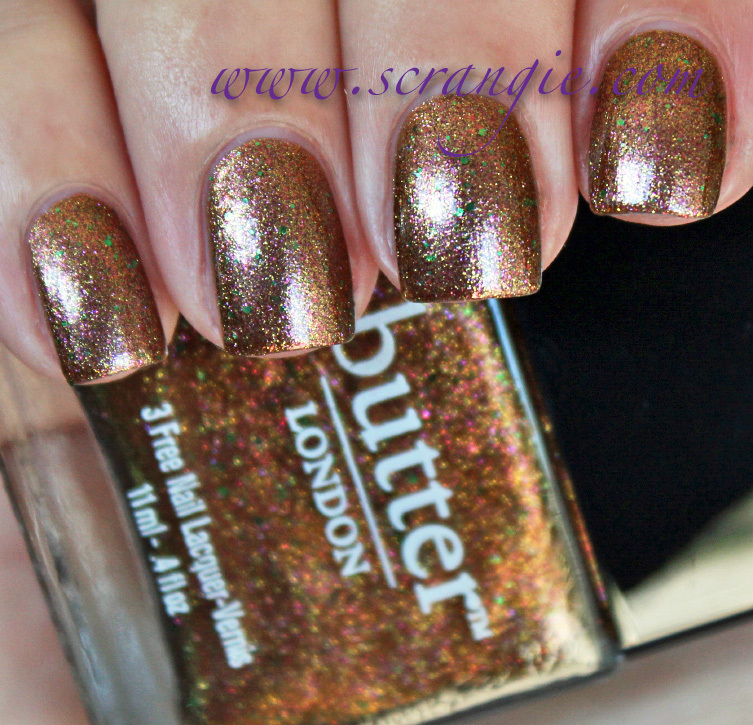 Butter London sure has been cranking 'em out lately! wow every one of these is beautiful! Scuppered and Jack the Lad are my favourites. 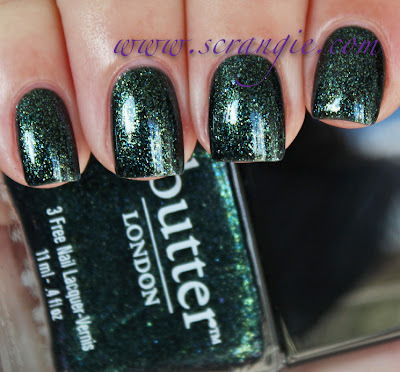 I don't have any BL polishes yet, though I might make an exception for Scuppered. I love that bright green glitter. Beautiful swatches, as always, but.... I think I migvht be the only person in the world not stoked about Butter's or Zoya's holiday collections. I think both their fall offerings were way more interesting. So I guess I'll either save myself some money or end up falling in love with a few as the season nears, lol. I love Jack the Lad and Shambolic - wow I really need to find Shambolic!!! Scallywag & Jack the Lad are absolutely gorgeous! How does fairy cake relate to China glaze I'm not lion? I feel like they (along with other companies) are copying what China glaze did with their fall holos. I can't complain about that though! Holy amazingness, you've just created a whole lotta lemmings!! Jack the Lad is definitely my favorite, which is saying quite a lot considering I'm not really into green all that much. The golden tones make it very pretty. oh wow. I love them all! I love nail polish. And I love that you love nail polish. I think you are pretty awesome for doing what you do. Nail polish is amazing and helps me get through hard times like when I get depressed. I wish to be you and I wish to be passionate about something. I've been reading every one of your blogs for at least 2 years. And your the only beauty blogger that I can remember your name which is pretty scrang. Yea that's me making a joke. But I really appreciate what you do. Your nails are so beautiful like candy and they make me hungry. Oh, man, Scrangie! Whenever I am on the fence regarding a polish, you usually come and know me right off! I love these and after the first few swatches I saw, wasn't convinced I needed any, but I am in love with Scallywag and Jack the Lad! It does look more like a holiday party collection, perhaps New Year's Eve. I really like Fiddlesticks & Scallywag! Thanks for the swatches! Scallywag!!! What would be a dupe for that? those swatches are pretty indeed!!!! 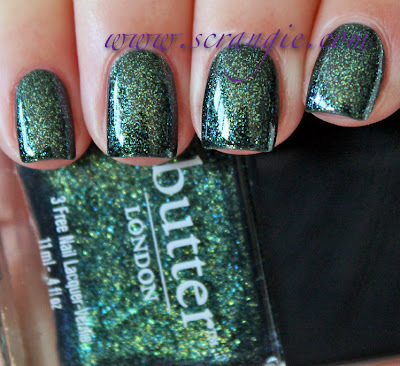 I've never been overly impressed by Butter London and I think they are overpriced, but I do like 'Scallywag', and I'm intrigued by the texture. I've never been overly impressed by BT, and I think they're overpriced. And if your swatches can't sell them to me no one can. I do like Scallywag though, and the idea of a sugary finish intrigues me. Thanks once again, Scrangie! 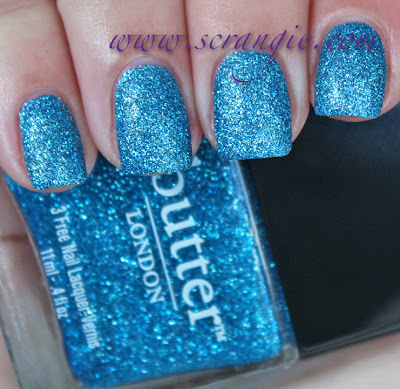 Butter london needs to stop making such great polish cuz they are making me broke! Oh My Gawsh!!! These are gorgeous!!! I love the sparkle in these so much!!! I agree, these don't scream "HOLIDAY!" but they are gorgeous nonetheless! Nice Butter london collection! Im really feeling Fairy cake, Shambolic, Fiddlesticks, and scallywag. Really great colors..not really Christmas type of colors but its differnt from the tradional red, greens, and blues we normally see so I love it. Can't wait to see these at ulta! Total win, I love butter LONDON polishes and I always love your swatches.